This harsh treatment of the people most brutally harmed by asbestos is critical to the financial solvency of the proposed $140 billion national asbestos trust fund. If mesothelioma victims were helped at the average level awarded through the current system of litigation and trusts, $2.2 million, taking care of mesothelioma victims alone would bankrupt the proposed $140 billion national asbestos trust fund, leaving no money to help the hundreds of thousands of additional people who will die of other asbestos cancers, or from the debilitating and often fatal asbestosis. As the Senate moves to consider this legislation, a new EWG Action Fund analysis of the most recent available data from the Centers for Disease Control and Prevention shows that deaths from asbestos are increasing, as predicted in the March 2004 Action Fund report, Asbestos: Think Again. In 2002, 3,939 people died form just two forms of asbestos disease, the signature asbestos cancer, mesothelioma and the often fatal non-cancer asbestos disease, asbestosis, with 2,578 and 1,467 reported deaths from mesothelioma and asbestosis respectively (for 106 individuals, both mesothelioma and asbestosis were listed as the cause of death). This represents an 8 percent increase from 1999, the first year that mesothelioma was officially recognized as a cause of death by federal authorities. Source: EWG, compiled from National Center for Health Statistics, 2005. For description of projections, see Methodology. Asbestos will claim thousands of American lives annually for at least another 50 years. EWG Action Fund estimates about 113,000 mesothelioma deaths over the next five decades, and a greater number from lung cancer during that time. 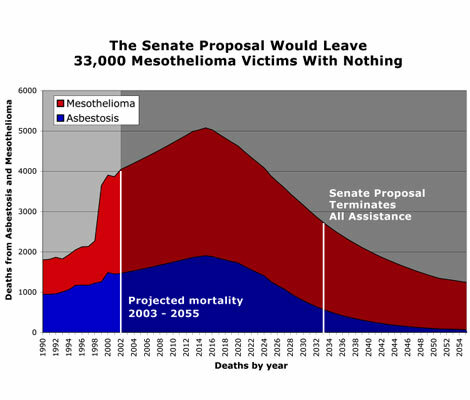 The Senate bill, which terminates the asbestos trust fund in 28 years (2033), will strand an estimated 33,000 people who will be diagnosed with fatal mesothelioma after that date, with no trust fund resources to aid them. Tens of thousands more asbestos lung cancer victims will also be denied any help because they, too, will be diagnosed with their fatal disease after the date when the proposed trust fund will expire. Thousands of additional victims of serious non-cancer disease will be similarly denied assistance.